Flyers winger Tyrell Goulbourne and Devils right wing Stefan Noesen push and shove in front of the net during the second period at Wells Fargo Center. 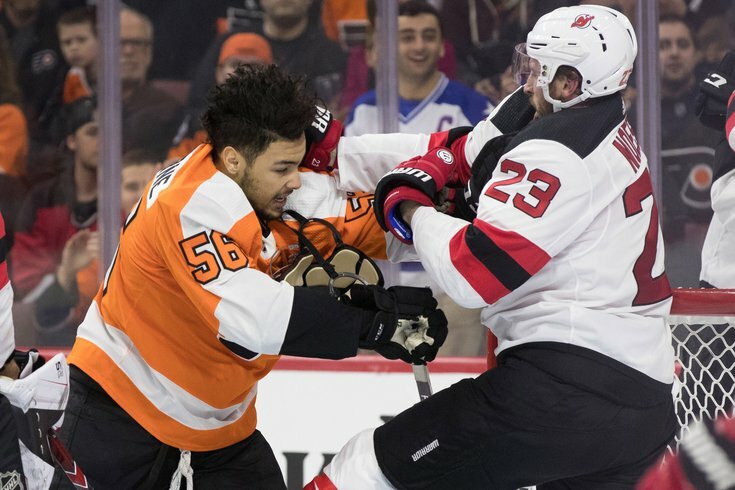 When Tyrell Goulbourne, the hard-hitting, 24-year-old winger from Edmonton, was up with the Flyers for a brief spell last month, he found out something about himself: He could play in the NHL. Goulbourne was sent back to the Lehigh Valley Phantoms last week and vowed to return. You get the sense the Flyers would love having him back. Listed at 6-foot, 200 pounds, though more likely 5-10, all Goulbourne did was blast opposing players with hard checks, wasn’t afraid to muck it up in the corners and gave a great boost of energy to a team that needed it. “I’ll be back,” said Goulbourne, who carries the jacked physical structure more for playing across the street at Lincoln Financial Field as a running back for the Eagles than burying guys on the ice playing hockey. “This has been a great experience for me. It’s a different level up here, obviously, and a dream that I got a chance to live. Goulbourne grew up in Canada playing soccer, then switched over to playing ice hockey and running track. It may explain his physique, which is compact and muscular, a little differently from the typical hockey build, which today is taller and leaner. “I still have some catching up when it comes to the game because I started hockey I would say later than most,” said Goulbourne, the Flyers’ 2015 third-round pick who has resurrected his career with his tenacious play. “I really didn’t get fully immersed in the game until I was 13 or 14, while most kids playing hockey in Canada would start out playing competitively at around 6 or 7. Philadelphia loves players like Goulbourne. On his first-ever shift in the NHL, Goulbourne nailed St. Louis Blues’ 6-foot-3, 210-pound defenseman Alex Pietrangelo with his second check, setting up a Scott Laughton first-period goal in the Flyers’ 6-3 win. “A year ago, I was playing in Reading, in the East Coast League, and this year I’m playing in the NHL and going between there and Lehigh Valley,” the rather soft-spoken Goulbourne said. “It’s been a blessing and I’m grateful for how long I was with the Flyers for. I enjoyed my time there and I want to go back. You get the sense that Flyers’ fans may be seeing Goulbourne again.